This January 7, 2010 marks the 67th anniversary of Nikola Tesla's death. 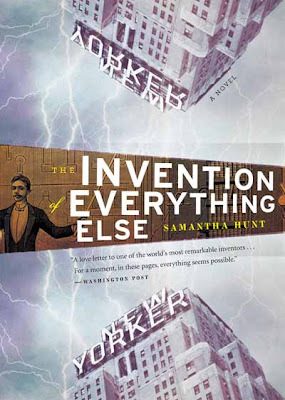 Tesla (July 10, 1856 – January 7, 1943) is the focus of this novel by Samantha Hunt, and I wanted to post this review close to that date in celebration of the life of Nikola Tesla. "From the moment Louisa first catches sight of the strange man who occupies a forbidden room on the thirty-third floor, she is determined to befriend him. Unbeknownst to Louisa, he is Nikola Tesla—inventor of AC electricity and wireless communication—and he is living out his last days at the Hotel New Yorker. Winning his attention through a shared love of pigeons, she eventually uncovers the story of Tesla’s life as a Serbian immigrant and a visionary genius: as a boy he built engines powered by June bugs, as a man he dreamed of pulling electricity from the sky." Shunned by the now modern society that Nikola Tesla helped to bring to fruition, author Samantha Hunt brings us her imagined story of Nikola's last days that he had lived out at the Hotel New Yorker. Through Nikola's thoughts, the novel flashes back to Nikola's childhood, his brother, and to the point that he immigrates to America in 1884. This is a story that encompasses many themes, from love, tragedy and loss, to the power of thought and unlimited creativity. The novel opens up to Tesla at the age of 86, and we get a feel for how the story is going to play out. The author uses flashbacks and multiple viewpoints to embrace the reader fully into the world of 1943, where hotel chambermaid Louisa meets and befriends Tesla just at a time that her father and family friend have decided to embark on a time travel experiment. Louisa is a simple character, and could have been more developed, but perhaps the character of Nikola Tesla simply eclipsed hers in this telling. I certainly felt like I knew more about Tesla from this book, and I was enthralled with the vivid imagery of New York City as the characters lived in it, along with the scenes on Long Island where Tesla had one of his last greatest experiments which failed miserably due to lack of funds and Tesla's fall from social graces. Nikola Tesla is a Serbian-born immigrant who came to the USA to test his inventions and work with Thomas Edison. Edison promptly fails him, cheating Tesla out of a promised $50,000 (worth much more in today's terms) in exchange for Tesla making Edison's laboratory more efficient. This was a sad sign of things to come for Tesla, where money issues seemed to plague Tesla forever after this incident. Although J.P. Morgan did back Tesla's experiments for a time, once Morgan learned that the invention that Tesla wanted to accomplish was free wireless electricity for all, Morgan pulled his support. Morgan had achieved a sort of monopoly by that time by reaping the benefits of the electricity revenues and he had no intention of giving it away for free. The novel does not focus on Edison or Morgan but they needed to be mentioned so that the readers understood the reason for Tesla's unsuccessful ventures. Tesla was successful with Westinghouse when they harnessed electricity using the power of the Niagara Falls, but this is also not covered very much except to say that Tesla tore up the contract where at that time was worth $12,000,000 in royalties. But Tesla did it for the greater good, for the power of electricity to survive and to keep Morgan from owning the company that Westinghouse and Tesla co-partnered. There were quite a few things that Tesla created, from X-Rays to the Tesla coil and robotics. There were murmurings of Tesla's insanity as he tried to harness the unknown from outer space, and thus he was immediately discredited as talking to Mars. The "Teslascope" was the invention in progress of Tesla's that he wanted to be his greatest yet, but in the world's eyes at the time of 1901 he was effectively becoming a quack. It was a secret experiment, and to this day is still a mystery to the modern man for what Tesla was trying to accomplish by communicating with Mars. The novel also touches on the Death Ray, also known as the peace beam, which Tesla seemingly wanted to use to end warfare, and that the F.B.I. were spying on him for this and other information. The USSR had paid Tesla $25,000 in 1939 after testing the first stage of the Death Ray. As you can see from my ramblings, the author successfully intrigued me with Tesla's life and his inventions, and she cleverly added the character of Louisa to dramatize and humanize Tesla outside of his professional endeavors. Tesla's meandering thoughts were inspiring and insightful; Louisa's life was an intriguing storyline herself where her father, Walter, has raised Louisa by himself thus creating a very strong father-daughter bond. Louisa meets Arthur Vaughn who amazingly does not bolt when he witnesses many of the crazy things that is happening around Louisa due to Tesla. Another endearing topic is that Louisa and Tesla both share a love for pigeons, and this shared trait is what helps Louisa and Tesla become more acquainted with one another. The novel includes telling quotes at the beginning of each chapter by J.P. Morgan, Tesla, Mark Twain and others. The story ends with a loss, but with a sense of rebirth and renewal and perhaps a greater understanding for the need for human companionship. Once I started this novel, I seriously could not put it down and I read the last 3/4 of the book in one sitting. A minor drawback is that this is not a long book and it had room for much more. It does not drag at all within the plot, as we leaped from the present to past and back again, but this was done in such a cohesive way that it enthralled me. I enjoyed the mentions of other people such as J.P. Morgan, George Westinghouse, Mark Twain and the conspiratorial F.B.I. When it was the eccentric Tesla's turn in the story there were times when he confused me; his thoughts were indeed very meandering and perhaps a bit tedious. I think it helped to show Tesla how he really may have been, and how he saw the inner mechanics of everything he came across. This book is an absolute must-read for those slightly interested in Tesla, who is the reason for the electricity currents we utilize today, and the added romance and intrigue make this a fabulous fictional account of a man who was misunderstood and mistreated. There is so much more to learn about and from Tesla, that this will not be my last book concerning him. In later years, long after his death, the Hotel New Yorker commemorated Tesla by installing a plaque in his honor, although the Moonies who had temporarily owned the hotel had refused to put the plaque up for a number of years. The plaque was not installed at The Hotel New Yorker until it came under new ownership in 2001, although it was created in 1977 for America's Bicentennial. From the Tesla Society, it writes that "Many famous people visited and lived in Hotel New Yorker, among them are Edward Hoover, Muhammad Ali, John Kennedy and others." Tesla had spent the last ten years of his life at The Hotel New Yorker, and his room at #3327 is the focal point as far as setting with the Hotel is concerned in Hunt's novel. The mention of the old laboratory in Shoreham, Long Island, then the Wardenclyffe World Wireless Telecommunications Station to Tesla, intrigued me very much because I grew up on Long Island and never heard of the site and Tesla's wireless ambition that enveloped him here. In fact, I don't even recall learning anything at all about Tesla in my studies. Why was that? Why was Edison the one who was so celebrated because of a light bulb? And I just found this article from 12/18/2009 that a plaque on this old Tesla laboratory was stolen from its brick building and has been missing for two months now. What a tragedy it is that still, after we supposedly realize the contributions that Tesla had made, that he is still being mistreated in America. 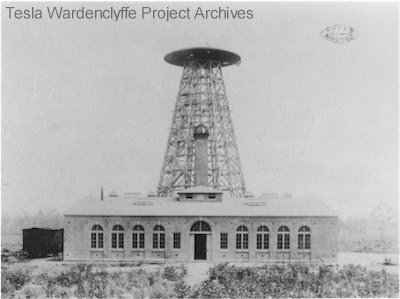 The Wardenclyffe site with a huge tower had to be sold by Tesla to pay his debts to the Waldorf hotel, and now stands empty and vandalized, and sadly, for sale. The owners will level it for the buyers if need be. It is amazing, and telling, that after years of progress and technological advances, that we still count on Tesla's alternating current to this day for our electricity needs. And yet, the very things associated with Tesla, such as his old lab, and plaques, are still shunned to this day. I thank Samantha Hunt for writing this amazing book and opening my eyes to the life of Nikola Tesla which needs to be celebrated. Another book that I recently read which mentions Tesla is The Kingdom of Ohio by Matthew Flaming. Although completely different stories in nature, the mechanical age is the common thread between these two novels and I recommend both of them for fans of Tesla. My review of The Kingdom of Ohio is completed, and can be found here.